Note: Experimental software MCA Theremino V6.2 was used for the scintillator testing. It is quite noisy, near background levels. We are talking very low counts per second (CPS) at this level, as low as one count every 100 + seconds. This can make it difficult to define if some very small peaks are actual isotope detections, or random variations in background levels. Note: This scintillator has around 50% efficiency at 60 keV. The brown and gold lines are the Banana tests, and the grey is background. 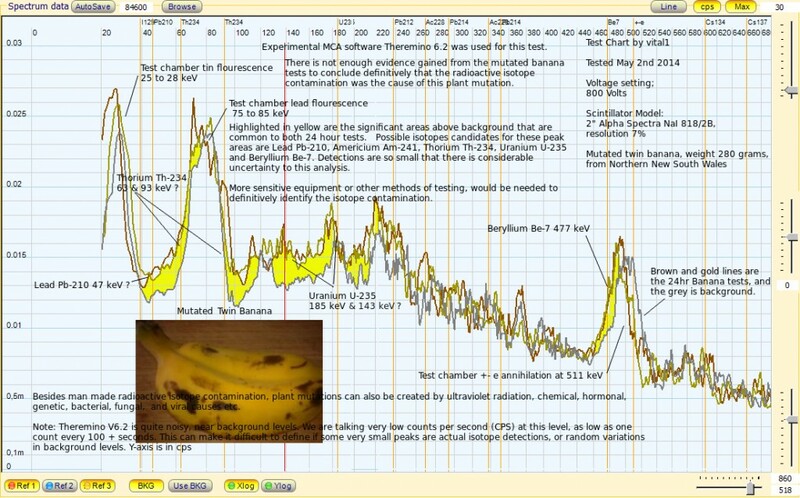 You will see both banana tests overlaid on the test chart. I have highlighted the significant areas above background that are common to both tests, in yellow. Possible isotopes candidates for these peak areas are Lead Pb-210, Americium Am-241, Thorium Th-234, Uranium U-235 and Beryllium Be-7. Common isotope peak markers are at the top of the chart. The suggested Lead Pb-210, Am-241, Thorium Th-234, Uranium U-235 detections were so small that there is considerable uncertainty to this analysis. If Thorium Th-234, and Uranium U-235 are present it, would indicate refined uranium was a contaminant. More expensive sensitive equipment would be needed to verify these detections. The bananas went rotten during the testing, and becoming liquid mush. This may explain the peak differences between tests, as sample material moved around during the testing period. The strawberry weighed was only 9 grams. This is a very small plant sample amount to test for possible trace amounts of radioactive contamination. Any possible peaks that showed up in the first test, turned out to be random variations in background. 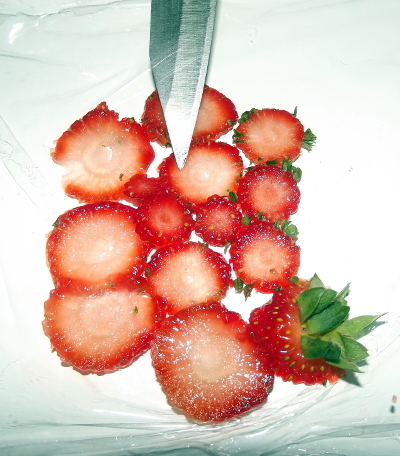 If there was any radioactive contamination present in the mutated strawberry, my equipment was not sensitive enough to identify it. Did radiation isotope contamination cause these plant mutations? There is not enough evidence gained from either of the mutated banana or strawberry tests to conclude definitively that the radioactive isotope contamination was the cause of these plant mutations. More sensitive equipment or other methods of testing, would be needed to definitively identify the isotope contamination. These are the first two plant mutations I have been provided with for testing here in Australia. Besides man made radioactive isotope contamination, plant mutations can also be created by ultraviolet radiation, chemical, hormonal, genetic, bacterial, fungal, and viral causes etc. Southern Hemisphere May 2014 rain water test report. May 2014 had 145.6 mm of rain. The test chart shows the presents of mainly Pb-210 and Beryllium Be-7. 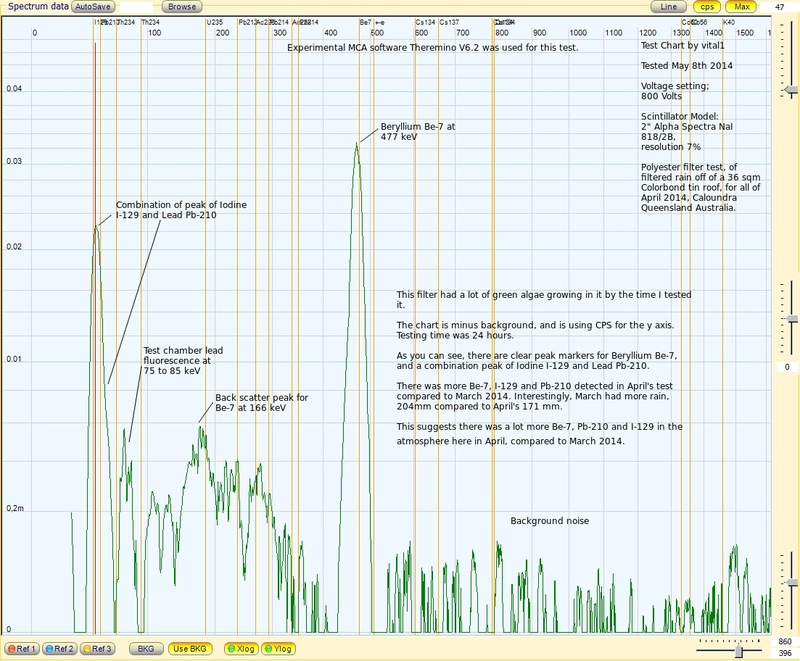 In this chart I have CPS on the Y axis to show activity, and have turned off Y axis log to show linear scaling. May 2014 was 13% above the pre-Fukushima average. 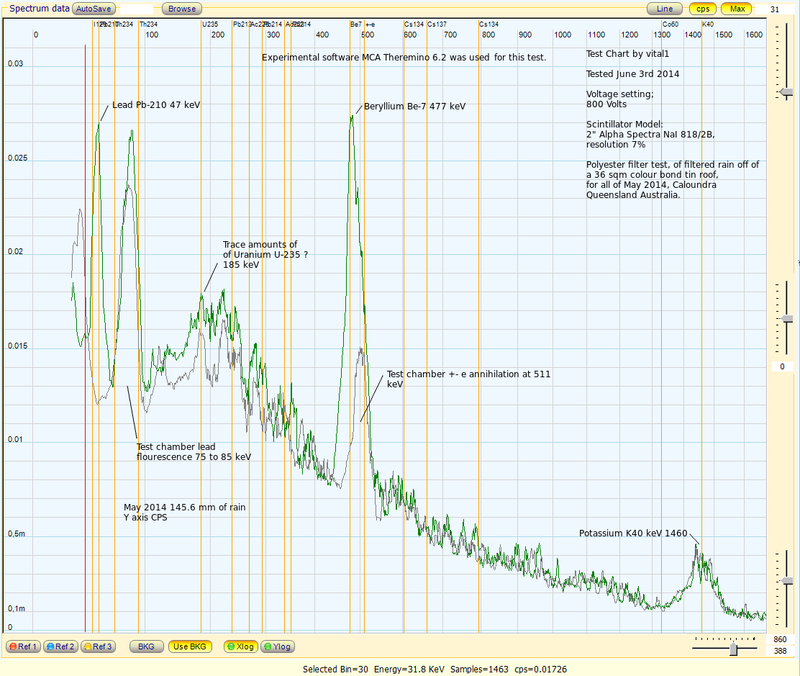 May 2013 was 7% above, and May 2012 was 7% above the pre-Fukushima ~0.10 uSv/hr month average. In the colder months I see a drop in background here, as most of the prevailing winds are from the Southern Ocean. May 2014 saw a 6% increase above May 2012 and 2013 month average background radiation levels. If you look at the May 2014 day average chart you will see more day to day dynamic swings in the day averages background radiation levels compared to 2012 and 2013. May 2014 was 13% above the 4 year pre-Fukushima May average. May 2013 was 7% above the pre-Fukushima month average. May 2012 was 7% above the pre-Fukushima month average. 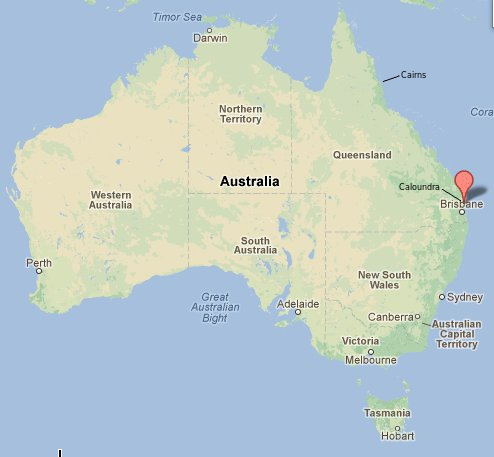 Recent Australian and New Zealand elevated detections. Sydney 26th May 2014 – I woke up with the alarm on (I set my Geiger alarm at 0.30uSv). Averages today are around 0.22uSv. Measurement confirmed by the second counter. North Island New Zealand 24th May 2014 – Kapiti Gaigakaunta radiation monitoring station detected two brief increases in background levels, as a weather event passed through the area. This filter had a lot of green algae growing in it by the time I tested it. The chart is minus background, and is using CPS for the y axis. Testing time was 24 hours. As you can see, there are clear peak markers for Beryllium Be-7, and a combination peak of Iodine I-129 and Lead Pb-210. There was more Be-7, I-129 and Pb-210 detected in April’s test compared to March 2014. Interestingly, March had more rain, 204mm compared to April’s 171 mm. This suggests there was a lot more Be-7, Pb-210 and I-129 in the atmosphere here in April, compared to March 2014. April roof down pipe filter test chart. A pre-Fukushima Argentina studying indicates that the I-129 would eventually reach the Southern Hemisphere, as it has from other major sources, like the nuclear fuel reprocessing plants of Cape de La Hague (France) and Sellafield (UK). 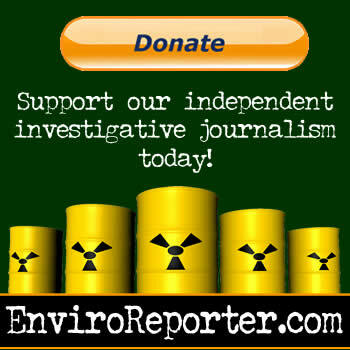 It has been suggested that the Japanese have been pumping large amounts of liquid Nitrogen and Boron onto the multiple molten coriums at the Fukushima Nuclear disaster. Neutron bombardment, plus lots of underground corium venting, has also been releasing large amounts Beryllium Be-7 and 1-129. For background on this subject read this article on using Be-7 as a tracer for I-129. Be-7 can also be produced by cosmic/solar ray spallation in the upper atmosphere. Be-7 created by this process takes around two weeks to reach sea level. The Sun has been very quite this cycle. There is a natural Be-7 / Pb-210 cycle here in the Southern Hemisphere, which means there should be more Be-7 and Pb-210 detected in the summer months compared to winter. Is some of this Be-7, I-129 and Pb-210 from Fukushima? The slight peak position shift to the left of the ideal in the April 2014 chart could indicate another isotope contaminant is also present with Be-7, around the same location. April 2014 was 22% above the pre-Fukushima average. April 2012 was 10% above, and April 2013 was 13% above the pre-Fukushima average. In the colder months I see a drop in background here, as most of the prevailing winds are from the Southern Ocean. The drop for April 2014 was less than April 2012 and 2013. April 2014 was 22% above the 4 year pre-Fukushima April average. April 2013 was 9% above the pre-Fukushima month average. April 2012 was 12% above the pre-Fukushima month average. 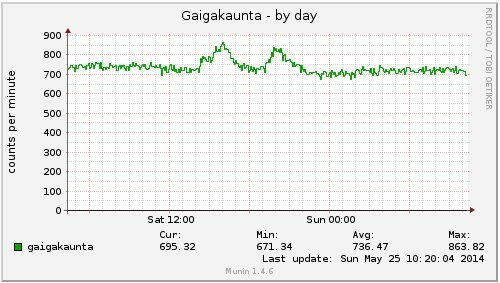 An unusual rain event around the 26th of March caused a drop in radiation for a couple of days. This was surprising. After investigation, I found the event was caused by a Southern low pressure system. You can see this Southern low around 1.40 seconds into this “Three Minute News” Youtube video. We had a significant spike in background on a dry 29th and 30th of March, when the air flow started to come from the tropics again.